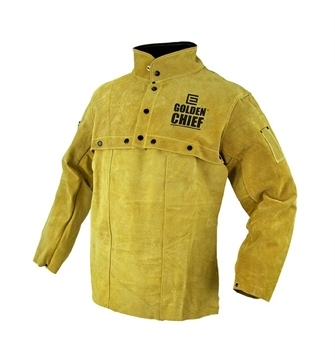 The GOLDEN CHIEF® premium leather welding bolero jacket with apron is made from selected GOLDEN CHIEF® leather. The jacket has a lined collar, sleeve pen pocket, adjustable press stud wrist closure and full press stud front closure. All seams are sewn with heat resistant Kevlar® thread. 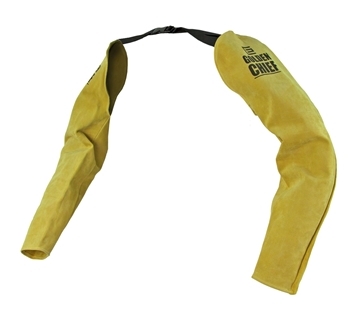 The GOLDEN CHIEF® premium leather welder's sleeves are made from selected GOLDEN CHIEF® leather. 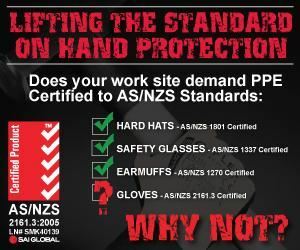 The sleeves have adjustable webbing straps and all seams are sewn with heat resistant Kevlar® thread. 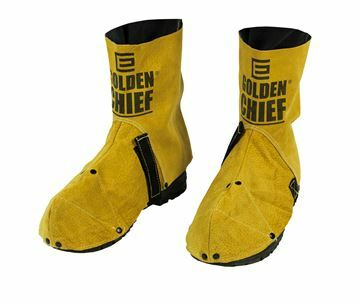 The GOLDEN CHIEF® premium leather welder's spat is made from selected GOLDEN CHIEF® leather. The spat has a Hook and Loop closure with strap and buckle under the boot. 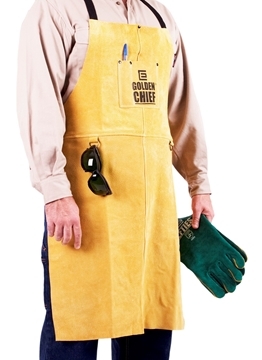 The GOLDEN CHIEF® premium leather welder's apron is made from selected GOLDEN CHIEF® leather. The apron is 910 mm long and 600 mm wide with adjustable webbing straps. 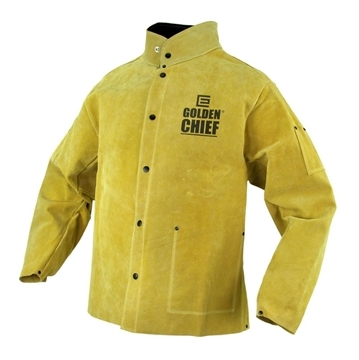 The GOLDEN CHIEF® premium leather welding jacket is made from selected GOLDEN CHIEF® leather. The jacket has an inside breast pocket, lined collar, sleeve pen pocket, adjustable press stud wrist closure, full press stud front closure and side adjusters.